Fred is finally back from his sojourn in Western Australia. Needless to say, Fred got stuck right in with helping on board. Here you see him merrily splashing bitumen paint about the place down below. It is such a pleasure to see his cheery face back on Lady Jane. I'm reminded just how much of a boost it is to have someone like Fred working alongside me. No prizes for guessing what I've been doing over the long weekend. In keeping with the rest of the UK, in what is traditionally a DIY weekend, I've been painting. Not that painting is exceptional for me, of course. 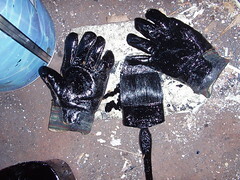 As you can see from the grim state of my gloves, I've been at the bitumen paint again, down below in the aft accommodation. (There are only so many pictures of the black interior I can take, so by way of a change you get to see the state of my gloves at the end of a weekend's painting). There is still more work to be done on the hull fittings, but once that's complete there is not too much more painting to do, and I'll finally have a first coat on in the aft accommodation. The second coat should go on much quicker, as I won't have steel to prep and should not have to worry about cleaning up too much after cutting and grinding down below. The galley ceiling is all up - at last. 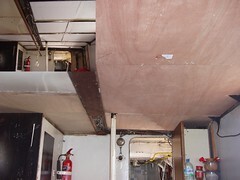 The inset in the picture shows the polystyrene insulation packed in before the plywood boards went up, this will cut down on the condensation in the galley. I know I have a small section of wiring to cover, but that will need to wait, as the missing bits are tucked away out of reach for now. I was going to put a thin layer of melamine, or similar, board up over the plywood, so the whole thing looked good, but I've decided to simply paint over the lot as this is only temporary anyway. I'm planning on extending the rear deck out to the edge of the boat, at some point, so at that stage the whole lot will need to come back down so I can weld without setting the place on fire. 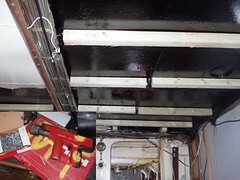 Thinking about it, the ceiling was originally pulled down so we could cut and weld the holes in the rear deck. Not bad for a project started in June 2005! I finally went out and bought a circular saw (thanks for the comments Jake and Andrew). In fact I've had it for some time now, but have been a bit scared of it. The potential for serious, permanent, injury is very real, as evidenced by the scars on the table I've been using as a workbench, some of which you can see in the picture. Those first few cuts were pretty educational! That circular saw cuts through wood like a hot knife through butter. I made a few 'guides' which I clamp onto the pieces I'm going to cut. No need to worry about measuring the distance to the blade from a straight edge or anything, just line the guide up along the line to cut and slide the saw down the rail. You can see one of the guides in the foreground, at the foot of my new saw horse. The saw horse is the latest addition to Lady Jane, inspired after seeing the one's Karen was using while doing woodwork for Wanderbird. It came out a fair amount sturdier than I had originally envisaged, but at least I don't have to worry about it blowing away or anything. 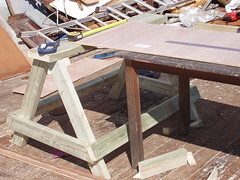 Cutting those large pieces of ply is now a much safer operation when using a guide and the saw horse. I'm still very circumspect when using the circular saw though. I had Mary over to help. As it turned out, we worked on putting up the new ceiling in the galley, rather than paint. Behind Mary, you can see that my deck is once again strewn with old wood, rusted steel plate and bags of rubble, this will all be cleared once I have enough to fill a skip. Anyway, while we were working, an unusually coloured duck, which Mary had commented on just minutes earlier, flew onto my deck, strolled over to one of the bags of rubble and, as calmly as you please, climbed in. Intrigued, we both went over to look, to see Mrs Duck sitting in amongst the folds of a bag staring back at us. You can only just make her out in the second frame (Click here for a larger picture and look for her eye right in the middle of the picture). A little later that afternoon, the duck flew off again so we got to peek in to see a clutch of six eggs laid on the concrete from the shower room. It amazed me to see the eggs simply laid on the rubble, with no effort to make a nest at all. Needless to say, work on deck has all but stopped, to avoid disturbing the duck. The next day, once Mrs Duck had flown off again I counted seven eggs. What I'm curious to know is how the little chicks are ever going to make it off my deck, as even using the sluices, it's a long drop down to the water. 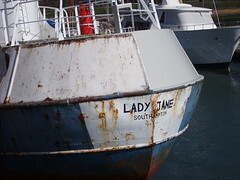 The weather has started to improve, with things getting much warmer over the last few weeks, so it's time to turn my thoughts to continuing painting on Lady Jane. I have a big stretch prepped up forward to paint, which is waiting on a combination of a dry spell and the absence of the swans, who are spending progressively more time on their nest. I also have a fair amount to paint at the stern, but this depends on a combination of good weather and the tides. I need the tide in to be able to reach the stern from my floating platform. The picture shows the start I have made on the upper part of the starboard side. If the weather is good, but the swans and tides do not co-operate, I still have plenty of white paint to go on elsewhere. Finally, if the weather does not co-operate, I have masses of painting to do down below in the aft accommodation space. One of the really great things about working on Lady Jane is the cool tools I get to learn about and 'play' with. I've been putting the timber framing up in the galley deck head using a Hilti gun, kindly on loan from Mick. You can see the results in the picture, with a picture of the Hilti gun and nails in the inset (click on the picture for a larger image). With the timbers cut to length, actually nailing them up takes seconds. You simply load a nail into the gun, push the muzzle of the gun against a piece of wood held in position, then pull the trigger. The Hilti gun literally fires a steel nail through the wood and well into the steel on the other side, holding the wood firmly in place, with a sound not dissimilar to that of a pistol shot. I know my timer framing is not coming down in a hurry, as much of the original timber framing on Lady Jane was obviously put up using a Hilti gun and, forty years later, they were tough to remove. A pretty impressive, although scary, bit of kit.